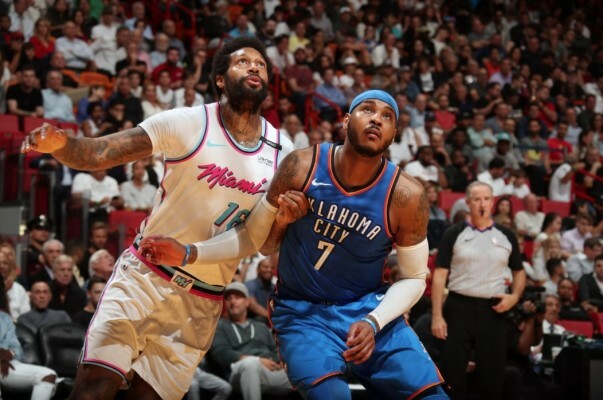 The activity that’s ensued after the Oklahoma City Thunder announced that they were parting ways with Carmelo Anthony primarily includes a number of teams that have appeal to the veteran forward. According to one ESPN insider, the Miami Heat are among this select group of teams that are vying to acquire a still-viable player at a highly discounted price. The strong likelihood is that the Thunder won’t find that elusive trading partner, which will lead to the waive-and-stretch scenario noted above. A key reason why the Rockets will offer a stiff challenge in any bidding war is that they’ve lost two forwards, Trevor Ariza and Luc Mbah a Moute, in the free-agency market. They also offer Anthony the chance to play with his close friend, Chris Paul, who recently re-signed with the team. Ultimately, the decision of Dwyane Wade to either return for another year or retire could play a major part in Anthony’s final decision. The two players also share a close friendship, with the discounted status of Anthony something that appeals to a Heat team that’s somewhat limited in what they can do because of the league salary cap. The 34-year-old Anthony began his career with the Denver Nuggets before being dealt to the New York Knicks in 2011. Prior to the start of last year’s training camps, he was traded to the Thunder. Over the course of his 15 years in the NBA, he’s averaged 24.1 points and 6.5 rebounds per game, though those numbers dipped to 16.2 and 5.8, respectively, last season.